Scores of youths have shut down the National Assembly complex, demanding the immediate resignation of Nigeria's Senate President Bukola Saraki. The reporters also demanded that the lawmakers revisit the grey areas identified in the 2016 budget by President Muhammadu Buhari and return the 36 exotic cars they recently acquired. 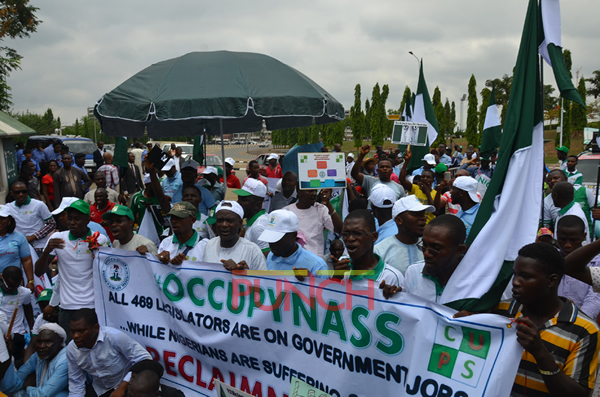 The protesters, under the aegis of the Occupy National Assembly, marched from the Unity Fountain within the Central Area of the city to the National Assembly, a journey of about two kilometers and forced their way to the main gate, defiling all security network mounted by regular and riot police officers. The youths forced the main gate closed thereby preventing staff, lawmakers and visitors from either entering or leaving the premises. The protesters, armed with placards containing various inscriptions, vowed to seal off the federal parliament for the initial three days to see whether their demands would be met. 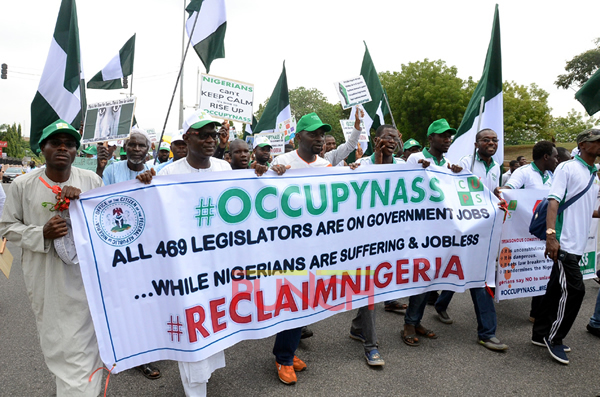 They also said they would resume a permanent protest that would paralyse all activities in the National Assembly until all their demands were fully met.